It’s the middle of a hot, hot summer and my iMac kept shutting off on its own. Just blacked out. I set an appointment with the Genius Bar, but since that’s a two-hour round trip for me, I decided to first do some research. 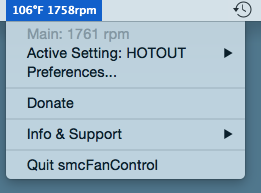 The fan control software lets you see the temp inside your mac and regulate the fan accordingly. Note: it really shouldn’t get above 115° Farenheit! You can also create several settings. Mine is called HOTOUT where I up the fan because I know it’s going to be hot in my house.